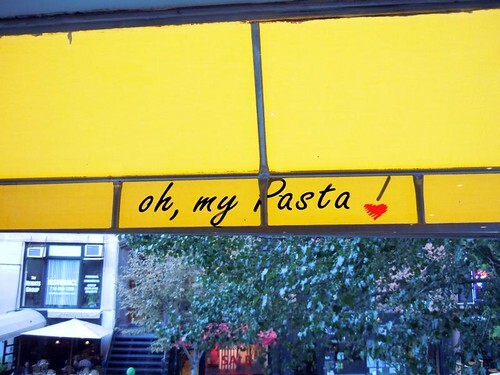 Comments Off on Oh, my Pasta! Whenever I’m out with a friend and decide its time to get a nice meal I have three types I’d gear for, Thai, Indian and Italian. The problem with Italian is that I feel weird paying for pasta dishes which I can easily make at home. I could probably make Thai and Indian dishes as well, but not as easily as Italian. 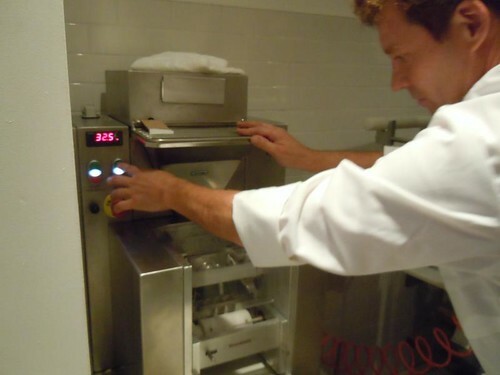 Most places use pre-made pastas, so you’re just paying for labor, but not ingredients you don’t traditionally can pick up at the grocer for cheap. What I’m always looking for is a place that not only mentions that their pasta is made in house, but prides itself in this fact. Luckily recently I finally found this place on Montague Street in the Brooklyn Heights section of New York City. While the restaurant might have a hokey name in “Oh, my Pasta!”, the cordial service and absolutely amazing food made up for it completely. We started our meal with their rendition of eggplant parmigiana. This isn’t the way you would expect it in a regular Italian restaurant, very heavy with lots of breading and topped with more tomato sauce than eggplant almost. No, this was a succulent portion cooked to a perfect palate that just melted in the mouth and really triggered the start of the meal. We decided to sample two of the pasta dishes. Tagliolini al pesto Siciliano and Troccoli alla carbonara. The silician pesto was made with basil, pine-nuts, shelled almonds, grated sheep’s milk Rodez cheese, tomatoes, and extra-virgin olive oil. It was served on Tagilolini which is a flat noodle, much like linguine for the lay-man, but more more delicate. 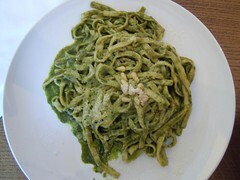 This pesto was just the right balance of flavors and the tagiliononi absorbed it so perfectly, it melt in the mouth. 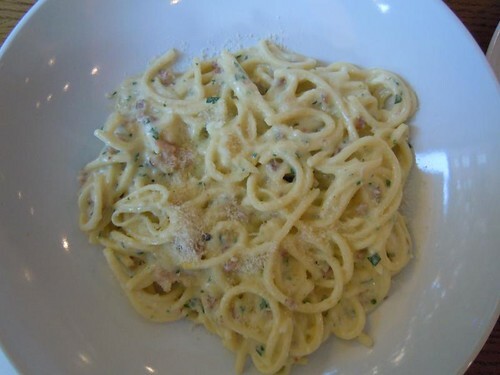 I serve carbonara at home on a regular basis, but never with Sheep’s Milk cheese the way they do here. Troccoli is a traditional spaghetti like pasta and the carbonara sauce didn’t take as well to Troccoli as the pesto and was lacking something, but was still delicious. It is possible that because I am working on various type of forms of carbonana sauce at home my mind and taste buds are more selective than with a pesto sauce which is much more intricate to make and why I don’t do it at home often. For desert we had an absolutely amazing chocolate tort. This thing was perfect in every way. I tend to despise raspberry sauce in chocolate but here it worked and was a perfect ending to an amazing meal. I must also bring up the amazing service here. While our waitress was brand new, actually having just started that day, the rest of the house from manager to owner and chef all made a point to be involved. While some criticisms on sites such as Yelp and other restaurant reviews sites have mentioned that when the place gets more full their front of the house to back of the house control can be lacking, I didn’t find it to be that bad and the food was definitely worth it. While I do not find myself in Brooklyn Heights as often as I’d like, when I have a group of acquaintances, colleagues or a female friend to impress I will definitely make a point of returning here.